In the Dr. Seuss book, To Think That I Saw It on Mulberry Street, young Marco sees a simple horse-drawn wagon on his way home from school. As he thinks of a story to tell his dad about his day, he quickly weaves that single image into an epic adventure that includes an elephant, the mayor, a brass band, and an airplane dumping confetti all over the landscape. Talk about embellishment! When you first begin designing a digital scrapbooking page, it all begins with an image that has some special resonance for you. Perhaps it’s a great photo—a beautiful scene, great color, special lighting. Or maybe the photo captures something from a great day: winning first place at the chili cook off, watching your spouse cross the finish line in a triathlon, sharing a moment with friends or family as you watch a gorgeous sunset. You can use iPhoto '09 to browse through all the photos on your hard drive and choose the ones that have that special something or emotional spark. A great photo is the heart of your scrapbook page. The next step involves taking that image and building a story around it. Embellishments, in the digital scrapbooking world, represent those extra items you can add to your page that help tell the story in a richer way. For example, you might scan the first place ribbon from the chili cook off and place it on your digital scrapbooking page. Or you could add the petals of a flower, buttons from an apron, or small tags and letter blocks that appear to stand out from the page. Other embellishments might include objects like photo corners, necklaces, bracelets, or rings, leaves or rocks, cooking utensils, baby pins—you get the idea. The button and ribbons you see here are just two examples of embellishments in this digital scrapbooking program. On a traditional scrapbooking page, embellishments are small items that you can affix to your page. In digital scrapbooking, embellishments are scanned images of small items to which you can apply effects that make them look three-dimensional. 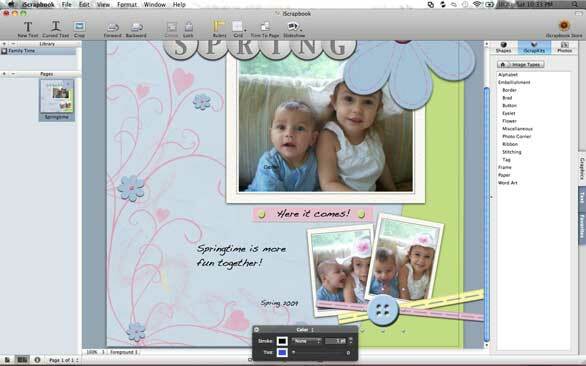 Digital scrapbooking software helps you add dimension, create shadows, and add light reflection—the result is that the embellishment can look just like that real element you would put on the paper page. So where do you get these embellishments that can bring more life to your digital scrapbooking pages? Embellishments can come from anywhere—but they will begin in your own imagination. You might find things around the house you can scan and clean up in a simple image editor like Adobe Photoshop Elements or Pixelmator, or you can find reasonably priced embellishments online, at sites like iScrapbook.com or iRemember.com. Think through the different physical elements that are part of the story the photo tells. If the image is from the beach, that might involve shells, sand, or a bit of beach towel. If the photo is from the chili cook off, embellishments might involve a recipe card, a cooking spoon, a bit of apron, or some charcoal briquettes. You can find images of the elements you want online or scan the real thing to get a digital image you can edit in your favorite image editor. If you add the embellishment to digital scrapbooking software, you will be able to position, resize, and add enhancements to the image to help it look like it stands out from the page. No matter what story you are telling with your digital scrapbooking page, there are always ways you can embellish the central image to tell the story in a richer way. Look around, think through the experience, have fun with it. You’re sure to come up with some great ideas that will turn your one-dimensional photo into a loud, happy marching band.